Bridging the Generations with Deliberative Dialogue in Arizona by Gregg Kaufman. 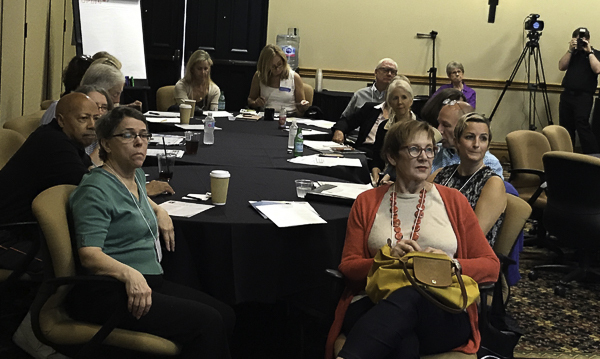 Over the course of five October days, National Issues Forums Institute (NIFI) representatives introduced deliberative dialogue at two national conferences in the Phoenix area. 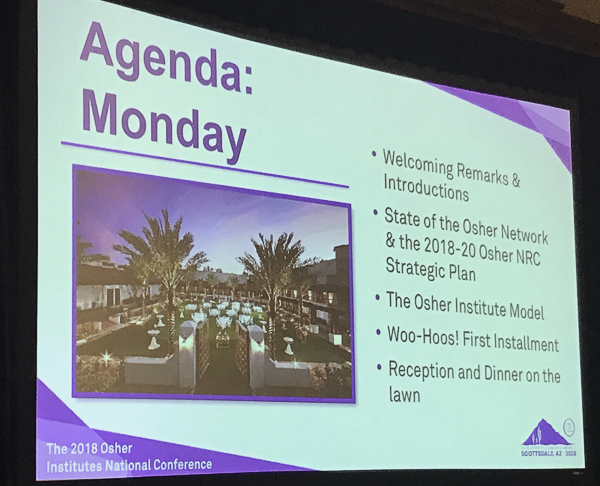 The National Osher Lifelong Learning (OLLI) Conference hosted OLLI directors and volunteers from across the country and 120 university OLLI programs. In addition to gathering in plenaries where keynote speakers, including Dr. Elizabeth H. Blackburn who won the 2009 Nobel Prize in Physiology or Medicine inspired the conferees, breakout sessions offered a variety of resources to enhance OLLI programs. Julie Mitchell, University of Dayton, Jeanette Toohey, University of North Florida, and Gregg Kaufman, NIFI Ambassador engaged participants who formed two forum groups to deliberate Coming to America: Who Should We Welcome? What Should We Do? The forum was followed by an orientation to deliberative practice and an overview of resource materials for incorporating a deliberative democracy course in their university programs. As nearly 300 OLLI champions departed Scottsdale, 1,600 university students, faculty, and professionals arrived in Phoenix for the Net Impact 2018 conference, Outside the Lines, at the Phoenix Convention Center. Net Impact inspires and connects emerging leaders to build a more just and sustainable economic and fiscal future for the world. There are over 300 university chapters in 40 countries. Students representing a variety of academic disciplines work with one another to become creative entrepreneurs, for-profit and nonprofit leaders, elected officials, and advocates. Net Impact corporate sponsors include the Walton Foundation, Campbell Soup, 3M, and Dell among many others. The Net Impact/Up to Us staff worked with Kettering Foundation staff to revise and update the NIFI guide, A Nation in Debt: How Can We Pay the Bills? Darla Minnich and Gregg Kaufman offered a breakout session where 100 students deliberated the national debt. Prior to the conference the Net Impact staff recruited 10 moderator snd Kaufman provide a webinar-based moderator orientation. Up to Us students are bright and talented. They arrived ready to deliberate having digested the issue guide. They worked hard to examine the actions and drawbacks within each option. Did they disagree? Yes. Did they find some common ground? Yes. and apparently, they enjoyed the process, as many participants posed for deliberative group photos. Like the OLLI conferees, Up to Us students left the Net Impact 2018 conference with resources to organize and moderate National Debt forums on their campuses. They are participating in a semester-long fiscal challenge competition with the chance to win a $10,000 grand prize. Hopefully, deliberative forums will become a contributor to their success. The Arizona Deliberative Bridge spanned young adults to chronologically gifted people, and what they shared in common was a dialogue method that is critical in bringing common sense and respectful discourse to a nation in need of both. NIFI is making partnerships with organizations concerned about the nation's future. We look forward to more amazing weeks and new bridges to build.